In this solo cooking adventure, Gary continues his love affair with his brand new claypot. 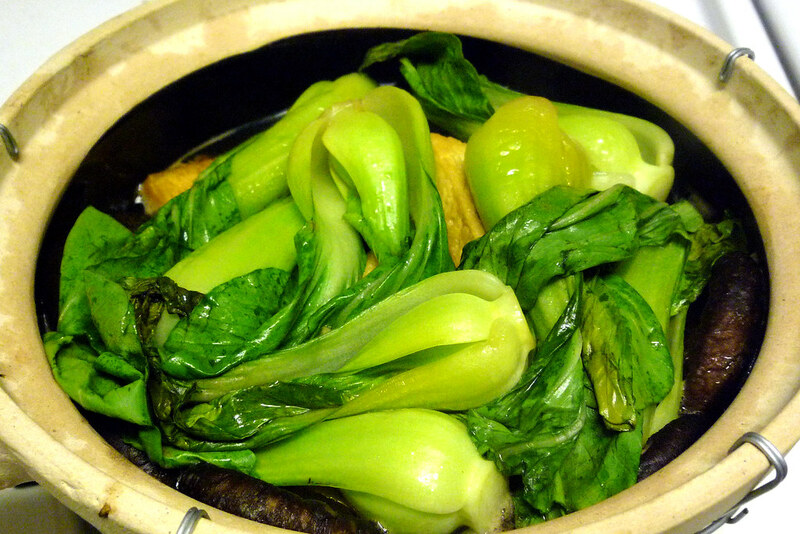 Braised tofu with mushrooms and baby bok choy in the claypot after it’s finished cooking. In love with the brand new claypot I used to make the chicken rice with Chinese sausage, I started a search for another recipe that would properly showcase this wonderful cooking tool. When you search in Google for claypot recipes, you’ll find tons to choose from but one that really caught my eye was a braised tofu recipe from Rasa Malaysia. Having grown up eating tofu on a regular basis, I’m squarely in the camp that loves it as opposed to a vast number who decry it as tasteless health food. Of course, they’re not necessarily wrong as tofu is fairly bland naturally so it’s reliant on a number of things. Texture, for one – silken and soft tofu is fine as they are but eating firm tofu out of the box does seem unappetizing. This recipe calls for frying the tofu first before braising so as to change the very nature of it. Flavor, of course, is the other factor in making a good tofu dish. Between the soy sauce (two kinds!) and additional spices, this dish does not lack for flavor. Put the tofu with all those flavors in the claypot together with some mushrooms and baby bok choy and watch the whole dish just come together. 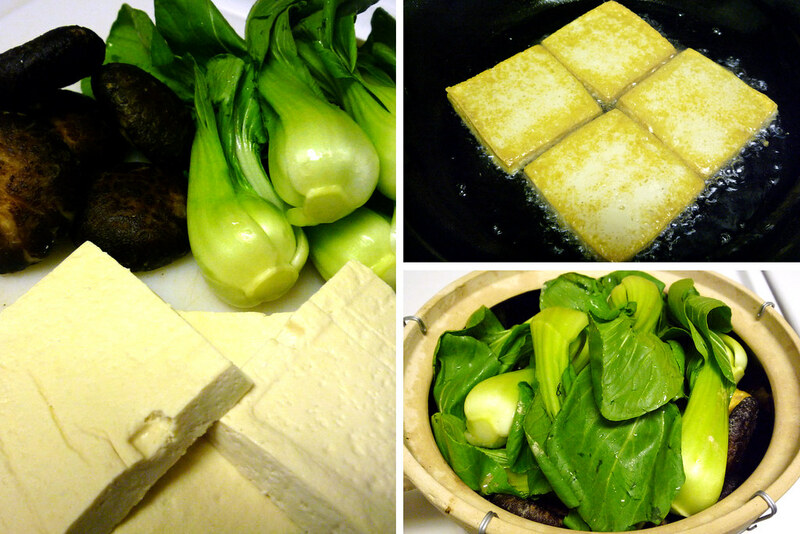 Left – the main ingredients for the dish: mushrooms, baby bok choy, firm tofu. Top right – frying the tofu. Bottom right – putting the ingredients into the claypot. By the way, if you read the original recipe, you’ll notice that it calls for browning some ground pork before adding the rest of the main ingredients. I guess it’s to add some flavor but that would keep this dish from being a vegetarian dish which was something I was looking to make (Kate being able to eat this would be a nice bonus). More importantly, I didn’t have any ground pork on hand so I chose instead to add a few tablespoons of the water the dried mushrooms soaked in, after having reduced it into a sauce. Altogether, the end result, as Kate describes: “the texture and shape of it, and having it over rice, made me feel like I was eating a piece of meat, which was a welcome change trust me.” Hey, always happy to show that cooking vegetarian doesn’t have to mean cooking boringly. 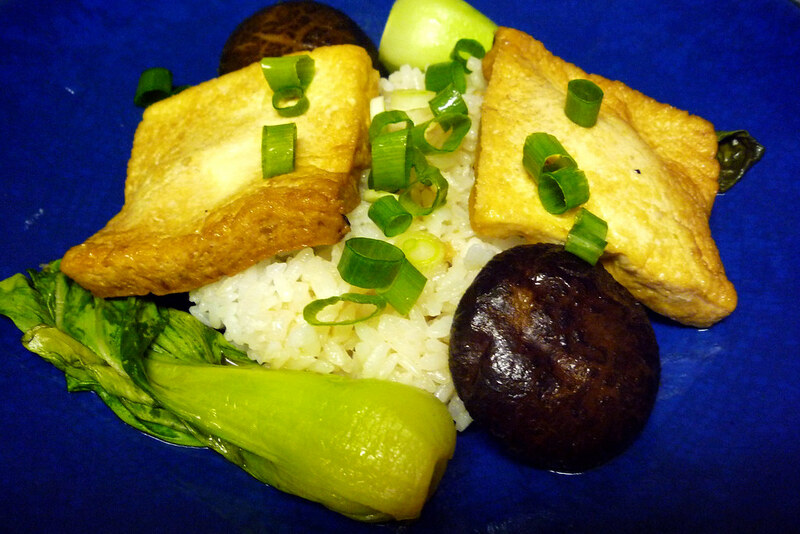 Braised tofu with mushrooms and baby bok choy, plated over rice with scallions on top for a garnish. Slice each block of tofu in half along the thinner edge like you would slice a bagel in half. Pat dry. Heat up your pan and add enough oil so that when the tofu pieces are set into the pan, it rises to just above halfway up the tofu’s edge. Fry the tofu on one side until you see the submerged edge turn light to golden brown. Flip and fry until the other side is also light to golden brown. Dish out and drain with paper towels. Set aside. Heat up the claypot and add 1 tablespoon of oil. Stir-fry the chopped garlic until aromatic. Add the mushrooms and the fried tofu. Add all seasonings and water and cover the claypot. Lower the heat to low and let it braise for 15 minutes. Before serving, add in the corn starch mixture to thicken the sauce. Toss in the chopped scallion and serve immediately, perhaps over rice. I saw a link to your blog from Foodista.com, looks like you have some incredible cooking going on! @Melissa Thanks! We’re always striving to create and try new recipes! @kim I think they still do, at least in NYC’s Chinatown. There’s a place in the alley between Bowery and Elizabeth that does that. I think they’re smaller so you’d be making individual sized dishes with them.